It has again been a while since I have reviewed a manga book. This is one of several atypical educational books that use graphic art to help teach difficult concepts or illustrate the action and another wonderful entry in the “Manga Guide to…” series that I have been reviewing. I keep requesting review copies of each title in the series as they come out, and I have yet to be disappointed. This is an impressive series that consistently makes very difficult academic topics more interesting and a little easier for students. I would not consider these a replacement for a textbook, and neither would the publishers of the series, but every book that I have reviewed from the series would make an excellent supplement, especially for the struggling student. 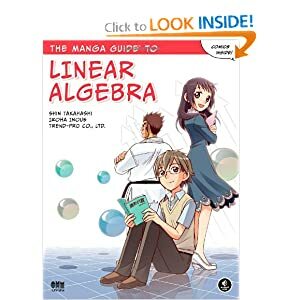 The Manga Guide to Linear Algebra follows the actions of a Reiji, who wants a black belt in Karate and to gain the interest of the girl of his dreams, Misa. She happens to be the younger sister of the captain of the university Karate club, and although her brother is intimidating, he offers to give Reiji lessons in exchange for Reiji tutoring Misa. You will have to read the book to see how that turns out. The book starts with an introduction to the characters, then an introduction to linear algebra. I admit, it has been many years since I studied the topic and I was interested to see how quickly I would pick it back up. The book made it easier than I anticipated, partially because it gives context for each concept presented. Knowing why something is important and how it fits into a greater scheme makes it much easier to understand and remember. Topics covered in the book include fundamentals like number systems, implication and equivalence, set theory, functions, combinations and permutations. We then transition into matrices with a “what is a matrix?” section, calculations, special matrices and lots more. Once matrices are covered in depth, vectors are introduced along with calculations, geometric interpretations, linear independence, bases, dimensions, and coordinates. Once we move into linear transformations and spend some time trying to get a handle on this difficult topic, the presentation turns to an interesting discussion of the relationship between linear transformations and matrices–again, this helps provide some useful context to a difficult idea to grasp. Finally, the book discussed Eigenvalues and Eigenvectors, including how to calculate them, multiplicity, and diagonalization. Then, the storyline surrounding the mathmatical topic is brought to a close. Studying linear algebra? This won’t replace your textbook and doing your homework, but it may help you figure out the context for and gain a deeper understanding of what you are doing. That alone makes the book valuable and earns it my recommendation as a quality introduction to the topic.